George MacDonald’s The Princess and the Goblin (1895) is in some ways unlikely material for a contemporary ballet, both because of its dubious literary merit and its deficiencies in comedic resolution. Less surprising, although greatly rewarding, is Twyla Tharp’s successful transformation of this story from the pedantic and pretentious original to the near-sublime story ballet. Her legendary mastery of inventive choreography and satisfying narrative are in evidence here, as is her skill in building meaningfully upon the best attributes of dancers. The result is both a paring down and a crystallization of MacDonald’s theme. The production’s commissioned score, a rich landscape for storytelling, is a fusion of romantic pieces from Franz Schubert united with original music arranged and orchestrated by scholar and composer Richard Burke. As with many fairy tales concerning a courageous main character’s quest for a restorative talisman, The Princess and the Goblin is set on a premise of conflict that exists at three levels: on the land, in the community and within the self. Princess Irene, danced in Atlanta by the sprightly Alessa Rogers, is both a disinterested heroine — in that she acts because of values rather than for gain — and a landscape for reconciliation, internal as well as external. The story’s conflicts are illustrated in the metaphors of castle and cave dwellings, both of which are at risk, of human and goblin communities, estranged but eventually united, and the pompous and self-absorbed king, danced by John Welker, who chases skirts, but is psychologically separated from the female principle in himself, represented in the character of his mother (and Irene’s grandmother) and danced by Christine Winkler. In Tharp’s ballet, the talisman — in a species of quotation from other coming-of-age ballet fairy tales, like The Nutcracker, Cinderella and Sleeping Beauty — is pointe shoes, a symbol of transformation to adulthood as a reward for success in confronting moral challenges, in this case the kidnapping and rescue of 11 children along with Irene’s consort, Curdie, danced by Jacob Bush and students culled from Atlanta Ballet’s dance school. In MacDonald’s original, the talisman is also a shoe, lost in the cave and sported by the monster Goblin queen who represents what — without the necessary reconciliation of the two communities — Irene has to become. In both versions, Irene is guided by invisible thread — the sometimes imperceptible ties that bind people to one another. The cave where most of the action takes place is both tomb and womb, an occasion for the possibility of death, but also for rebirth and renewal. In the MacDonald story, the Goblin society is defeated in a battle followed by a slow and grudging semblance of peace. One reality in American dance companies is a dearth in the artistry that emerges from impeccable classical training. Here, in its absence, athleticism is the highest value. Since choreographers must use what they’ve got, after all, they make dances for bodies that leap and spin and do tricks. Often the effect of this kind of choreography is a dumbing down and condescension that can be miserable to watch. Tharp, however, addresses the challenge in an enlightened way. Rather than pandering to our supposed low tastes, she reaches into history. The choreography for The Princess and the Goblin is rooted — at least in part — in the Moscovian tradition of acrobatics and clowning. Another face of Tharp’s commitment to her vocation is the artistic development of dancers. Company members in Atlanta vary in ability and experience to a large extent, and seasoned artists work alongside apprentices in nearly every production. Tharp speaks to the best in each dancer. “When we worked with Twyla, everyone grew and changed. She enlightened all of us, from talking about costume to the development of each character, helping dancers identify with their personas. Now, they are doing everything differently, with a new sense of discovery,” says McFall. 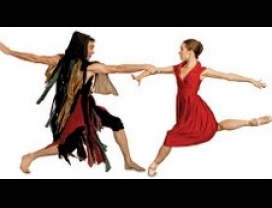 The Princess and the Goblin is a co-production of the Royal Winnipeg Ballet and Atlanta Ballet and had its world premiere February 10 at Atlanta’s Cobb Energy Performing Arts Centre where it ran for two consecutive weekends. The two companies have a historic association — Artistic Directors Lewis and McFall collaborated for The Magic Flute (2009) and Moulin Rouge (2010) — as well as a long affiliation based on mutual regard and a shared aesthetic sensibility, mission and commitment to dancers. The ballet premieres in Winnipeg in fall 2012. By Miriam C. Jacobs in PERFORMANCE REVIEWS on August 18, 2012 .